All has been quiet on the cooking front lately. I seem to go in and out of cooking phases, and I'm currently 'out', but I'm reading the French Laundry Cookbook and Heat by Bill Buford so I expect I'll have a renewed enthusiasm for cooking soon. 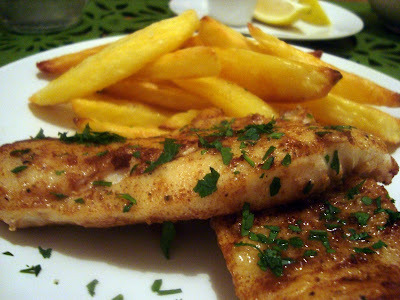 Anyway, this is the sort of dish to cook when you can't be bothered cooking: basic grilled fish and chips. Sweetlips has disappointed us the last few times we've been there, so we thought we'd make some at home. The fish: season and dust in a little flour, then pan-fry over medium-high heat in butter and a little olive oil. Sprinkle some lemon zest over the top and add a bit of lemon juice and parsley at the end. The chips: cut into roughly 1cm chips, add to a large pot of cold, salted water. Bring to the boil, then immediately drain. Leave to steam/dry for a few minutes in the colander, then spread in a single layer on a baking sheet. Toss them in plenty of olive oil and salt, then roast at 220c for about 40 mins (or until they're nice and crispy). Serve with a few slices of lemon and tartare sauce. We're currently approaching the bloggers we feel will add the quality and interest we need to the Food & Wine section of wordonthestreet. If your interested i'd love for your blog to be involved, give me a buzz on laura@wordonthestreet.com.au. Thanks! Look forward to hearing from you soon!